What is your favourite season of the year? I honestly cannot decide. I think I love all four of them because each has something unique and special about it and without one I would not enjoy the rest. After a hot and sunny Summer I am embracing the Autumn with my open arms. I love the slight coolness of the morning air, heavy rains and grey skies, yellowing leaves dancing in the wind and chilly evenings. Autumn is always the time when I start craving hot chocolate. With both hands gently wrapped around a warm cup and savouring every sip of that delicious drink cozily snuggled up on a couch with a favourite book. That's the Autumn I love. 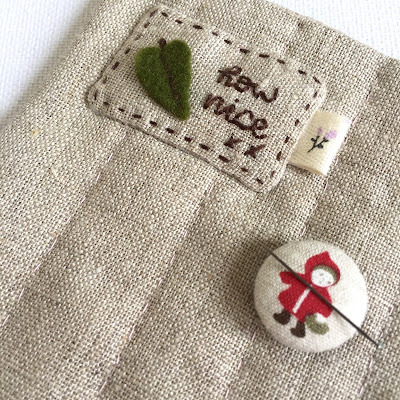 This Belle and Boo fabric is called "Woodland Walk" and is my absolutely favourite. 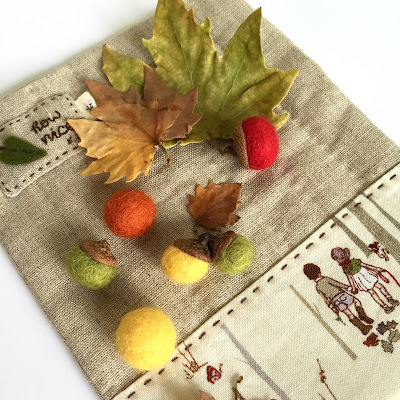 The tiny details bring so many childhood memories of walks through bushland and parks in Autumn with my family and friends. Picking beautiful yellow leaves to bring home and arrange them in a vase, trying to find the perfect acorn or spotting toadstools. Oh, how nice! There is something magical about acorns, don't you think so? We went for an early morning walk with my Little One the other day around the block, but even though we live in the city, we still were able to find pretty maple leaves and even picked some miniature acorns for which I am very grateful. Have you ever tried making felt wool acorns or balls? It's so much fun! It's almost like therapy, a meditation because you can only focus on this tiny wet soapy piece of wool in your hands to get it right. I glued the acorn caps on top of these colourful balls and they look so cute. 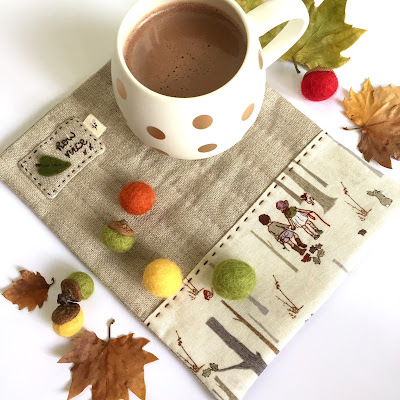 Mini Hug Me Mug by Robert Gordon is absolutely perfect for this little mug rug I finished the other day and for my autumn hot chocolate. It really feels so g-o-o-d to hug this little mug. I went for the simple straight line quilting on the linen part of the rug, but instead of using two strands of quilting thread, I used only one strand of Gutermann Quilting Cotton Colour 3117. It's almost not noticeable, but it gives a lovely texture to the mat. 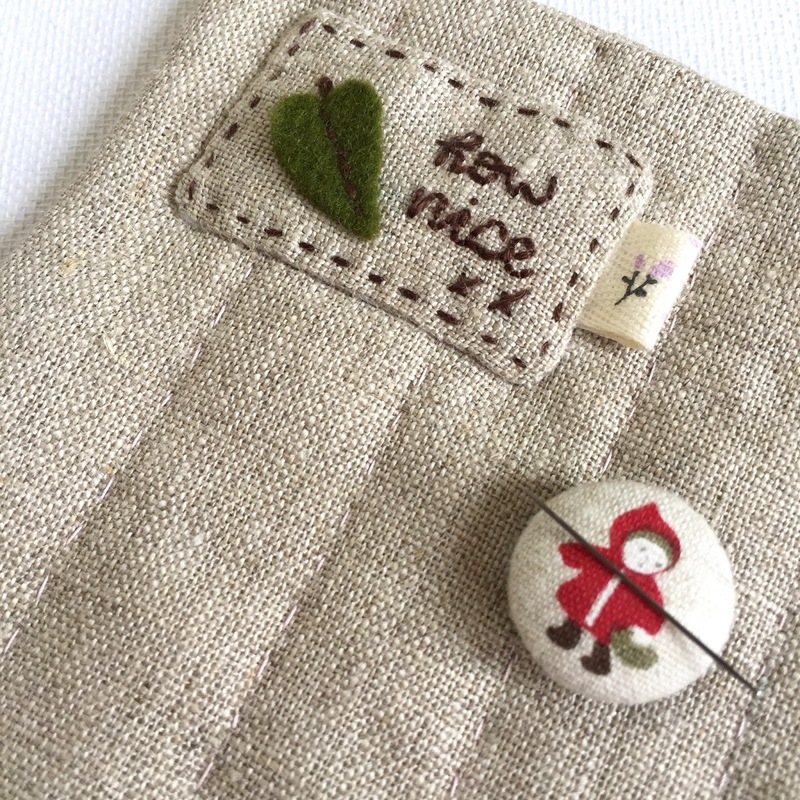 Minimal details to bring out the sweetness of Belle and Boo fabric. Can you spot a butterfly, bunny and oak leaves? I made this mug rug much bigger than a coaster, but much smaller than a placemat. 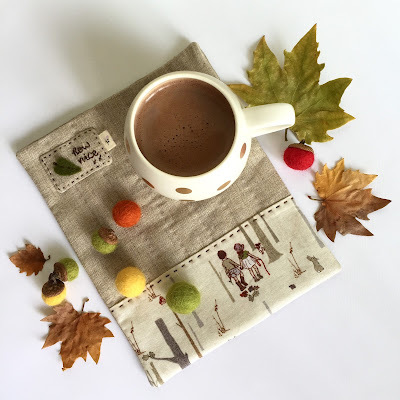 I always feel sorry that the design of the coaster is being covered by a mug and a placemat is too big to keep on my work desk, so I made sure to keep my favourite piece of fabric open and have enough room for a mug on this rug. P.S. : A few years ago, me and my So Big Son worked out a perfect recipe for hot chocolate that we all enjoy. It's a bit time consuming to make, but sure thing it's delicious! Give it a try. In a small bowl beat cream, sugar and vanilla until thick. Keep it in the fridge. Put cocoa powder in a small bowl and add boiling water. Mix well until smooth and creamy and there are no lumps. Pour milk in a small saucepan and heat it until just boiling. Switch off the heat and put chocolate in the saucepan, add the cocoa mix. Stir gently with a balloon whisk until the chocolate melted and the mixture is smooth. Pour hot chocolate in a cup, top it with cream and generously dust with cinnamon. Enjoy! I love autumn as it means winter is coming. Unfortunately, we are heading into spring, which fills me with dread as the warm weather is coming.